Zaravshan River flows on the territory of Central Asia. It is an ancient feeder of Amudarya River. In ancient times, the local people called the rive “Daitya”. The River feeds mainly by snow and glaciers. It crosses border of Uzbekistan, flowing through the territory of Tajikistan, then it turns the north-west, creating a unique oasis, where is located the fabulous city Samarkand. Zarafshan River flows TO Navoi city, irrigating the arid lands through Kattakurgan, and then turns the south-west. The length of the river is 877 km; the basin area is 17700sq.km. Large left feeders Fandarya, Kshtut, Magian flow into the river, running through a narrow deep valley. Near Samarkand the River divides into two horns - Akdarya (north) and Karadarya (southern). There are Bukhara and Karakul oases in the lower stream. Zarafshan waters are also used for irrigation. 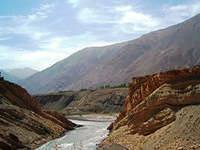 Zarafshan valley is populated especially where are located such cities as Samarkand, Kattakurgan, Navoi, Bukhara, Kagan. Zarafshan River is comparatively smaller and less well-known river than Amudarya and Syrdarya. Despite, it has more economic importance and as mentioned above, its waters are used for irrigation.